The All channel is a man made 18 km long head race channel, which provides water for power production and cooling purposes for Wacker Chemie AG, a chemical factory employing 10,000 people. The channel is located in Bavaria, Germany, 40 km north of the city of Salzburg. The channel was built early in the 20th century and was lined with concrete slabs, installed between 1920 and 1922. 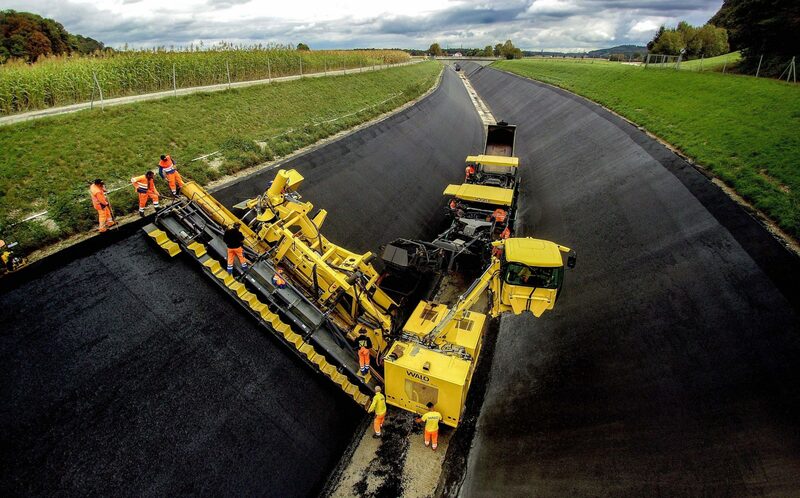 Extensive rehabilitation of the surface of the channel was required to ensure the channel remains watertight and maintains maximum efﬁciency for the owner. This was a turnkey project for WALO, who had total responsibility for all the details of the design and the engineering solution as a lump sum contract. WALO faced a number of challenges – as well as the channel being very long, its sides have an incline of 39°, meaning the lining teams were working on fairly steep and narrow slopes throughout. WALO’s new channel paving machine has been perfectly designed for carrying out exactly this kind of work. In addition to the new ’channel paver’, several new machines were manufactured and adapted for this challenging project. The time available was also strictly limited, with the channel only remaining empty for eight weeks. In order to complete the work as quickly as possible, four to ﬁve of WALO’s specialist lining teams were working simultaneously, with one working on the horizontal placing while three to four others worked on the vertical placing. Prior to the lining works, the existing concrete surface was roughened and cleaned by high water pressure. To ensure the process was carried out efficiently and safely, it meant careful coordination of heavy machinery and the labor force, working in very close proximity to each other in a comparatively conﬁned space. Despite these challenges, the entire project was carried out to schedule in three months and impounding started earlier than scheduled.